Just a little nod in the direction of a great resource for world-building and historical accuracy. If you’re don’t own this book and you write Steam Punk, Historical fiction, Time-travel, Fantasy, whatever – you totally should. 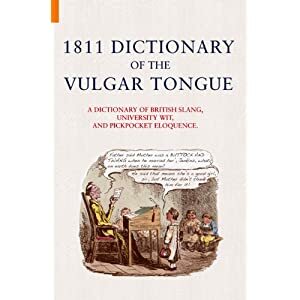 Essentially it’s a compilation of slang used by actual people, back in the day – circa 1790 to 1820. You’ll find bits of peasant cant, Romany and just the conversational words used by the average everyday Joe of the moment. The beauty of it is that the book was actually written in 1811, so copyrights don’t really apply. You can find it over at the Gutenberg Project for a quick look through electronically, or buy one of the many versions out at the book store. (If you click the link you’ll find it in both hard cover and paper back, and I think it’s also out for the Kindle, as well. This entry was posted in blog and tagged resources. Bookmark the permalink.